Beautiful Home in Wilkerson with lots of Space! 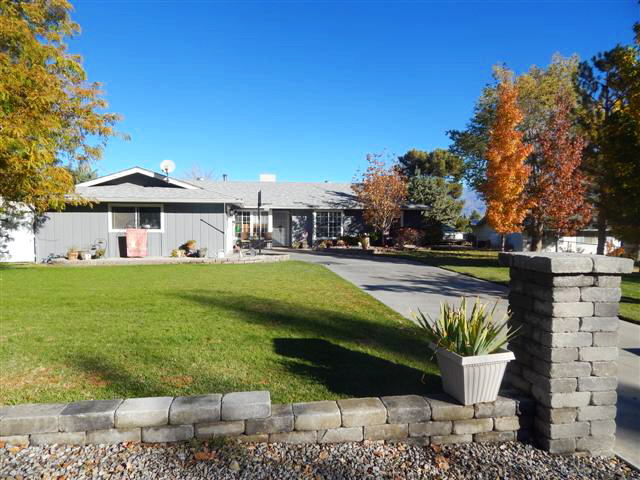 269 Sierra Grande is located in the Wilkerson area just south of Bishop California. This friendly neighborhood is family friendly and great for people who like open land and great views. This beautiful 3 bedroom 2.5 bath home located on 0.6 acres in the newer part of Wilkerson; approximately 5 miles south of Bishop’s city limits. The home has a spacious living room with a wood burning stove, remodeled kitchen with nook, and an expansive family/bonus room addition with vaulted ceilings. The master bathroom has a vanity area and huge walk in closet. The beautiful backyard is fully fenced and has automatic sprinklers. Zoned as a horse property, there is plenty of room for animals, for “toy” storage or both. The fully landscaped backyard has mature trees and garden areas. The Wilkerson area is about 10 minutes south of Bishop, tucked up to the Sierra Nevada Mountains. This small area has amazing views overlooking the valley and the White Mountains. This quiet neighborhood is desirable for buyer who wants to be out of the city but still can have the convenience of being close. The area has a variation of families from just starting up to settling down and retiring. There is easy and quick access to mountain trails to explore on foot, off road vehicles or horseback!